Installing a vent-free propane heater is one of the best upgrades you can do for your RV if you plan to be spending a lot of time in chilly places. 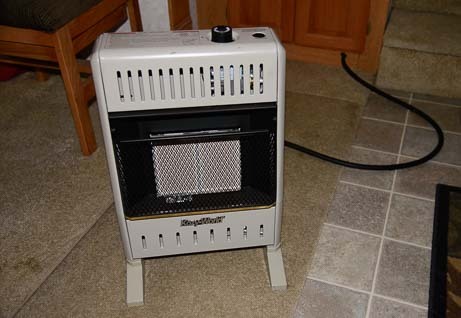 This page reviews how ventless propane heaters operate in comparison to traditional RV furnaces, it discusses the different technologies used in the design of various types of vent-free gas heaters on the market today — including catalytic heaters, ceramic brick and plaque heaters, and blue flame heaters — and it presents a step-by-step guide for installing a vent-free propane heater in your RV or camper. This post was first written in January, 2009, but was completely overhauled and rewritten in October, 2014. 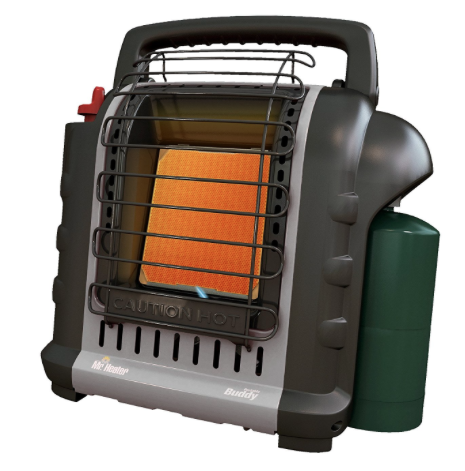 Happiness is… a vent-free propane heater! We froze in our trailer during our first winter in Arizona. Morning temperatures in the kitchen were often 40+ degrees F, and although daytime temps could get as high as 70, as soon as evening came, the temps in our trailer dropped into the the 50’s. Brrr! It’s hard to sit around in the evening in those kinds of temperatures. 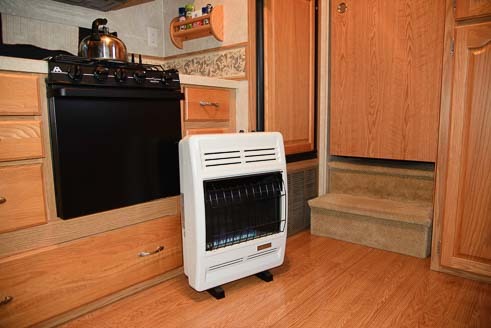 All modern motorhomes and campers (ours included) come equipped with a propane furnace. However, these loud, inefficient beasts use a lot of electricity, and can drain the batteries in one night. 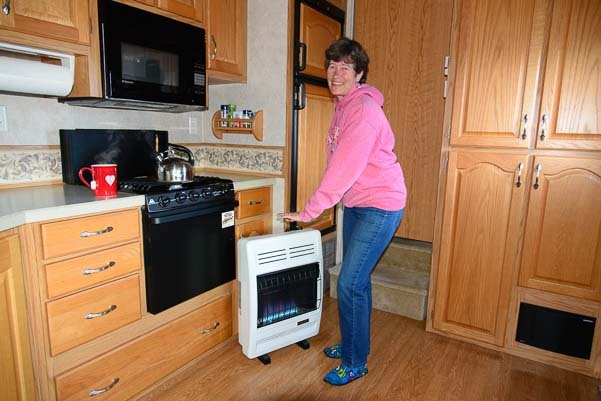 During that first winter (2007-08) in our 27′ Fleetwood Travel Trailer, we discovered that the more experienced winter desert boondockers (both snowbird RVers and those living the full-time RV lifestyle) installed vent-free propane heaters in their rigs. These are wonderful little appliances that use far less propane than a furnace and no electricity at all. When we upgraded to our 36′ Hitchhiker 34.5 RLTG fifth wheel in May, 2008, we decided we would install one. All summer long we thought about the project, but never found ourselves in a town where there was a good selection of heaters to look at or anyone knowledgeable about installing them in RVs. So we dawdled. As the nights got colder in late November, 2008, and we relied more and more on our trailer’s electricity-eating furnace, we found ourselves in the warm company of our good friends Bob and Donna Lea Jensen and their vent-free, electricity-free propane heater. 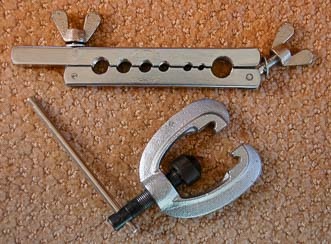 Bob has installed quite a few of these little devils over the years, and he gave us some hints and loaned us two critical tools for the project: a pipe cutter and a flaring tool. We learned a lot through this process, and I thought it might be helpful, along with our other RV tips and tricks pages to include some notes here about our project. There are several types of vent-free heaters on the market, and each has its pros and cons. In the end, we opted to buy a 20,000 BTU thermostatically controlled blue flame heater made by Vanguard. The night before the installation we laughed as we bundled ourselves into our recliners wearing multiple layers, buried under blankets for the last time. Mark’s face peaked out from under his hood as he read. The night after the installation, in shorts and t-shirt, I had to poke my nose out the window to get some cool air. In our excitement, we had inadvertently heated the bedroom to 85 degrees. We have used and loved this heater year-round ever since, running it near sea-level in the southern states in the winter months and using in the cool mountains during the summer months! Propane uses oxygen as it burns and gives off moisture as a by-product. Therefore it has the potential to use up all the oxygen in an enclosed space and kill any living, breathing occupants while creating a layer of condensation on the insides of windows. Yikes! To accommodate these unpleasant aspects of propane heating, conventional RV propane furnaces use a large blower system to bring in outside, oxygen-rich air. In turn, they vent the moist, oxygen-depleted air from inside the rig to the outside. Circulating the air this way keeps the oxygen level in the air fairly constant and significantly reduces the build-up of condensation on the insides of the windows, as the moisture gets blown outside along with the exhausted air. However, by blowing all this warm air outside, the furnace is effectively heating the outdoors. If you stand outside an RV next to the furnace vent on a really cold day, you can warm your hands and body quite nicely. Also, this blower requires electricity to run. RV furnaces are DC, so they do not require an inverter or generator in order to operate. However, the amount of power they use is astronomical (our 40,000 BTU furnace uses 11 amps DC). If you are boondocking, or dry camping in the desert as many winter Snowbird RVers do, you are then faced with a choice of either keeping the RV unacceptably cold, or using a generator to keep the batteries charged (even our big solar power installation on the Hitchhiker 5th wheel was not enough to keep up with the furnace blower during the winter). Besides heating the outside air and running the batteries down, a major disadvantage of a standard RV propane furnaces is that the blower is really loud. There is nothing like being deeply absorbed in a really great movie and listening to some very profound dialog being exchanged in whispers, and having the furnace suddenly roar to life and drown out everything being said. Our furnace blower often woke us up out of a sound sleep too. In contrast, vent-free propane heaters are silent and provide heat without using any battery power. This is because they rely on you to give them fresh air: you have to crack open a window while they run. All US-made vent-free heaters are built with an internal oxygen sensor that shuts off the heater if the oxygen level in the room becomes too depleted. In addition, most RVs come equipped with an LP gas detector that will sound alarms if the oxygen in the air drops too low or if an LP gas leak is detected and you can install a combo LP/CO detector as well to detect both LP gas and carbon monoxide. You may also need (or choose) to run a small fan to circulate the air. This will use some battery power, but you can decide how much or how little to use the fan. Brrr… This was what life was like before we installed our vent-free propane heater! So, in essence, when using a vent-free heater, you must find a happy balance between several variables. Determine which kind of heater will best suit your needs (see descriptions below), figure out where to place it in the RV, which window(s) to crack open, and how often to run a fan (if at all), and if so, which kind of fan to use (a little DC fan, like one used in a computer, a large AC ceiling fan that will require an inverter or generator to run, or an optional blower fan that can be purchased with the heater). Heat rises, so in 5th wheel campers the heat tends to gather in the bedroom. Simply close the door to the bedroom, or crack it slightly open to control the movement of the warm air into that space. Likewise, if you use a ceiling fan, you can experiment with running it forward or backward, either to draw air up and move it out along the ceiling or to push the warm air down towards the floor. Propane has a fixed capacity for providing heat. One gallon of propane contains 92,000 BTUs of potential heat, which means a 40,000 BTU RV furnace running full blast will burn through nearly a gallon of propane every two hours or so. During the coldest periods, it is a real pain in the neck to keep having to refill the propane tanks as you fly through propane trying to heat your rig. Our Lynx travel trailer came with a 30,000 BTU furnace, and our Hitchhiker 5th wheel came with a 40,000 BTU furnace, both installed at the factory. These were sized appropriately for the square footage of each camper. However, we have found we can easily heat our big fifth wheel to higher temperatures in less time using our 20,000 BTU vent-free propane heater instead of the factory-installed 40k BTU RV furnace. So, a smaller vent-free heater that burns less propane per hour can effectively heat a given space more quickly than a traditional RV furnace that is twice its size. Because of the inefficiency of RV furnaces in terms of propane use and battery power consumption, when we use the RV furnace alone for heat in 30+ degree F overnight temps and 40+ degree daytime temps, we find we have to keep our trailer at 50 degrees while sleeping at night and at just 60+ degrees during the day. Cold as that sounds, this uses up almost a gallon of propane a day and we can barely keep the batteries topped off using our 490 watts of solar panels alone. Worst of all, living like this is really uncomfortable. Using our vent-free blue flame heater in the same conditions and burning the same one gallon of propane per day in those conditions, we can easily keep the 5th wheel at 76 degrees all day long. And we use almost no electricity. To clarify, we have two 30 lb (7 gallon) propane tanks, and when outside highs are in the 50’s and lows are in the 20’s, we go through a tank of propane each week. When outside highs drop below freezing 24/7, we can go through a tank in 3 days. WHICH IS THE BEST TYPE OF VENT-FREE HEATER? When choosing a vent-free propane heater, there are a lot of products on the market. Catalytic and ceramic heaters produce infrared radiant heat which heats objects situated nearby much the same way the sun does. They create a warm, baking sensation on your skin, but if you move away (like moving into the shade outdoors), that sensation goes away. The air in the room warms up over time as the objects in the room warm up. In contrast, blue flame heaters heat the air, rather than the objects in the room, providing a more even, uniform warmth. Gradually, the objects in the room heat up as the overall temperature of the air in the room rises. All of these heaters come in different sizes, ranging from 5,000 to 30,000 BTUs, which are good for heating 100 square feet up to 1,000 square feet. Small ones can be hung on the wall, out of the way, while big ones that appear modest-sized in the show room suddenly become monster heat sources that dominate the floor space when you get them home to your RV. Catalytic heaters were the original vent-free heaters. The major brand is the Olympian Wave, manufactured by Camco, and their primary models are the Wave-3, Wave-6 and Wave-8 heaters. These provide 3,000, 6,000 and 8,000 BTUs of heat respectively. Catalytic heaters provide infrared radiant heat by way of a large pad on the surface of the heater. A chemical reaction in the pad causes heat to radiate off the entire pad. If you stand in front of a catalytic heater, your skin will feel a nice baking warmth on it. The closer you sit, the more you will bake. This is a great feeling when you are chilled. These heaters have been in use for years, and have an enthusiastic following. They are also quite expensive ($300-$430), often as much as double the cost per BTU as the other types of vent-free heaters. They do not have thermostats, just a “high” setting and a “low” setting, so you must manually turn them on and off or to high or low to regulate the temperature in the RV. If the pad on these heaters becomes dirty, it is possible to replace it for about $100. A friend of ours tried to clean his by vacuuming it, and inadvertently ended up destroying the pad. Because the pads had changed slightly since he bought his unit five years earlier, he could not replace the pad and had to replace the entire heater instead. You will need a brass elbow fitting from Camco for the installation. You may also want leg stands so the heater can stand on its own two feet and a dust cover to protect the catalytic pads when it is not in use. Ceramic infrared heaters are a slightly newer technology that has been warming RVs for quite a few years. The most popular brand on the market is Mr. Heater. Other brands include Kozy World, Empire and ProCom. These are generally offered in one, two, three and five brick configurations providing 5,000, 10,000, 15,000/20,000 and 25,000/30,000 BTUs of heat. Ceramic heaters provide the same infrared radiant heat as catalytic heaters. Across the front of the heater there are small ceramic “bricks” or “plaques” that heat up to a glowing orange/red color. Like a catalytic heater, standing in front of a brick (or plaque) ceramic heater will toast your toes to your thighs on the front of your legs. The heat from the bricks interacts with your skin and you will feel a wonderful tingly warmth. These are extremely popular units and can be quite inexpensive ($130-$350). Most can be purchased with or without a thermostat. One big disadvantage is that the area directly in front of the bricks gets hot enough to burn things. Any flammable items that come too close to the bricks could catch on fire. If a cat or dog wanders past and flicks its tail against the bricks, it might get singed. If a toddler sticks its fingers in there, a trip to the hospital might ensue. Blue flame heaters are the newest technology and provide a different kind of heat than the catalytic and ceramic heaters. Rather than radiating heat, blue flame heaters operate via convection (the principal that heat rises), drawing cool air in through vents at the bottom of the heater and emitting warm air out the vents in the top. This is a heating method that is much like central heating in a house. Once the air temperature has risen sufficiently, the objects warm up as well. If you keep your RV at a warm temperature all the time (especially at night), the objects in the room will never get cold. Blue flame heaters draw cool air in from floor level through a row of vents at the bottom, heat it up, and emit the warm air out of vents at the top, relying on convection (the fact that heat rises) to move this air instead of using a blower. You can warm your hands and body by standing in front of one, but it is more of a warming sensation than a baking one. The area in front of the blue flame is covered by fireproof glass (it’s actually a ceramic material) and it is not burning hot. So, there is no risk of items immediately in front of the heater catching fire. Blue flame heaters are a good idea for people with pets or children. The most popular brand is Mr. Heater. A few others include Empire Heating Systems and ProCom, the same makers of the ceramic brick heaters. These manufacturers produce both blue flame and brick heaters in the same chassis, so other than the appearance of the bricks or the flame, the unit itself has the same look whether it is the brick or blue flame version. The typical BTU range on these heaters is 5,000, 10,000, 20,000 and 30,000. Blue flame heaters are as popular as the brick ceramic heaters, and are in the same price range of about $130-$350. They can also be purchased with or without a thermostat. There are some wonderful blue flame heaters that are designed to look like fireplaces, complete with logs, trim and beautiful wooden mantels. 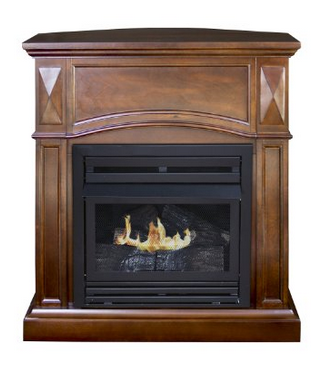 Manufacturers include Pleasant Hearth and ProCom. These cost about $200-$300 more than the regular blue flame heaters, but what a beautiful addition to your RV. You can sit and watch the yellow flames dancing around the logs and warm your bones at the same time. I saw one of these units in an old travel trailer and was enchanted. The owner had built his own mantel out of an old coffee table, and it was lovely. I wanted one of those units so badly!! The only place for a unit like that in our rig was along the backside of the “L” in the kitchen counter, which is just a few inches from the wall of the entertainment slide-out when it comes in. If we had the carpentry skills, we probably could have slipped a fireplace in there, recessed under the counter. The only downside would have been that it might have gotten a little hot under the counter, and we would have had to be extra careful that the heater was fully cooled whenever we brought the slide-out in, or we would have cooked the gelcoat on the outer wall of the slide. Also, as it turned out, that particular location for the heater would not have provided the same warmth when we sat in our recliners as the heater does in its current spot in the kitchen in front of the oven (even though it would have been closer). It’s just the way the air flow circulates in our particular trailer. 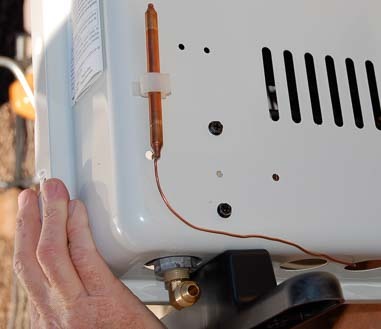 If you don’t want to hassle with installing a dedicated gas line for a vent-free propane heater in your RV, you can opt to get a portable unit instead. The portable ventless heaters are all infrared radiant heaters with bricks (plaques) that have air intake vents in the bottom for convection as well. They have built-in blowers that run on a 6 volt a/c adapter (sold separately) or on 4D batteries. They are very popular. They are manufactured by Mr. Heater (with the brand name “Big Buddy”), and they come in sizes from 4,000 to 18,000 BTU. They run on the small Coleman style portable propane canisters but can also be connected to a larger BBQ style propane tank. 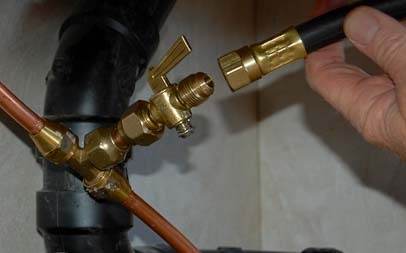 If you plan to run the heater from a large propane tank instead of the little propane canisters, Mr. Heater sells a companion flexible gas hose with a regulator and quick release connector on it for just that purpose. Mr. Heater make nice carrying cases for these heaters as well. Usually this option is just $30-$50, and it is well worth the cost if you plan to be in your RV for extended periods of time. A manually controlled heater will have several heat settings (usually three), but you will need to monitor the heat in the room and adjust the settings as you get warmer or cooler. A thermostatically controlled heater will cycle on and off as its sensor detects changes in temperature. Ours typically cycles on and off in 5-10 minute increments, keeping the temperature within 2 degrees. On our unit, the thermostat has a simple analog dial that can spin from “1” to “5.” These are arbitrary numbers rather than fixed fahrenheit degree markers. However, once you figure out how “1 1/4” or “2 1/2” relates to temperature, you can keep the temperature in the room tightly controlled by turning the dial to the setting you want. This is especially nice if you plan to keep the heater on all night, as the temperature in the RV will remain constant while the outside temperature drops. Most units are designed to be hung on a wall, however most also have an optional stand so they can be placed on the floor. Most smaller units include the feet as an option (about $25) while most larger units come with the feet at no extra charge. The great advantage to hanging a unit on the wall is that it is always there, ready for use. 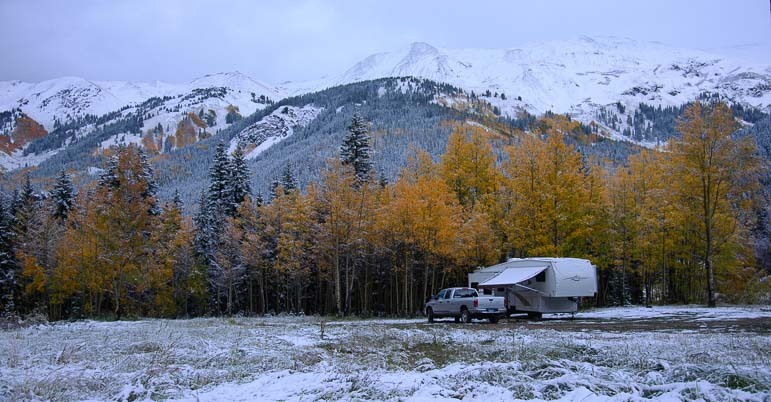 If you use your RV during all four seasons, it is nice to know that if you suddenly find yourself in a chilly spot, you can simply flip the switch and have your heater working for you, rather than digging it out of the back of the closet (a lesson we learned after the fact!). The advantage of having the unit standing on its own two feet is that you can move it around the rig. This is especially true if you don’t use a fan of some kind to move the warm air around the rig. If you go this route, make sure you have plenty of flexible gas hose so you get maximum range for placing the heater in different spots in the rig. Most ventless gas heaters can be purchased with an optional blower. As soon as you start blowing the air around the RV, you are signing up to use the batteries to keep the rig warm, something the vent-free solution was aiming to avoid. However, the power consumption should be less overall than a furnace. Some blowers are thermostatically controlled, allowing them to cycle on and off as needed. This is efficient, as the blower and batteries won’t be in use all the time the heater is on. Rather than a built-in blower, many people opt to install a small DC fan which uses very little power. If your rig has a ceiling fan, that can also be an option, although it will require the inverter or generator to be turned on. In our case, our inverter is turned on from the moment we wake up until we go to bed, so running the ceiling fan when the heater is on during the day is no big deal. When we installed our ventless propane heater, we tried placing it in several locations. We also tried turning our ceiling fan both on and off and running the fan both forwards and backwards (blowing towards the floor and towards the ceiling) before we settled on a final arrangement. to be moved around the RV. We found that the best setup was to place the heater directly below our ceiling fan (in front of the oven at the base of the stairs in the kitchen) and to set the fan to blow towards the ceiling, drawing the warm air up and distributing it outwards throughout the RV. It was astonishing to find what a difference it made as we moved the heater to various places in the trailer and tried each placement with or without the ceiling fan, and blowing up versus blowing down. Our RV is a “rear lounge” fifth wheel, and we found that the area around the recliners was a significant cold air pocket. Doesn’t it figure! That’s where we like to be on cold evenings!! There are large windows surrounding the recliners, which make that area cold, while the warm air in the rig congregates high up on the ceiling just in front of the stairs leading to the bedroom (that is, if the bedroom door is closed. Otherwise the warm air settles in the bedroom itself). We assumed that facing the heater towards the recliners just 5 feet in front of them would warm up this cold pocket. Wrong! No matter how high we set the thermostat, and no matter what we did with the ceiling fan (which is located 10 feet away right in front of the stairs leading to the bedroom), the recliners were still cold. When we moved the heater to the base of the stairs leading to the bedroom, and turned the ceiling fan on “high” and set it to blow towards the ceiling, we could immediately feel the warm air encircling us as we sat in the recliners. Who woulda thunk??!! There are legal ratings for the sizes of vent-free heaters and the rooms they can be operated in. Less than 6,000 BTUs is okay for a bathroom, and less than 10,000 BTUs is okay for a bedroom. These are the ratings that are being referenced when you see a sticker on a larger unit saying “not designed to be used in a bedroom.” The idea is that a large unit operated at max volume in too small a space will use up too much oxygen in the room too quickly. Of course, such a scenario would have the occupants of the room running out the door because it would be way too hot for comfort. Some people may worry that these kinds of ventless propane heaters aren’t safe, fearing that it might blow up the RV or suffocate them. These heaters are extraordinarily well regulated by various governing bodies, and designers have to meet stringent guidelines and submit their heaters to a battery of very challenging tests before they can be brought to market. Vent Free is the industry organization for all the vent-free gas heater manufacturers. Their website spells out all the testing, guidelines, state by state requirements, laws and safety record for these heaters. Through September 1, 2005, they claim that there had not been a documented death due to a vent-free propane heater (see that claim here). Visit their website at ventfree.org. In addition, at the factory, RV manufacturers install a LP Gas Detector Alarm system (various brands are used) to detect LP gas leaks in the RV and alert anyone inside. These are installed because many RVs come equipped with propane-based appliances, including things like the stove, oven, hot water heater, refrigerator and RV furnace. All RV owners should be aware of where their LP gas detector is located. It is usually installed near the floor, as LP is a heavy gas that settles down low. Propane is found in highest concentrations near the floor. Some RVers run their vent-free propane heater overnight as they sleep. We don’t do that. If the overnight low temps will be well below freezing (i.e., 25 degrees F or below), we run our RV furnace, set to 50 degrees, all night long to keep the plumbing from freezing, because the furnace is ducted throughout the basement. Most of these heaters are sold with an official limit for operating altitude. The problem at higher altitudes is that there is not enough oxygen for the propane to burn properly. Some units are rated for use up to only 3,500 feet, while other manufacturers have a stated limit of as much as 5,000 feet. Our blue flame vent-free propane heater is rated for use up to 4,500 feet, but we have used it extensively at altitudes up to 8,500 feet and have used three times for two week periods at 10,000 feet. The key to operation at altitude is the Oxygen Detection Safety-pilot (ODS) sensor which has been standard equipment on all US-made vent-free heaters since the 1980’s. This sensor shuts off the gas to the heater when it detects the oxygen level has dropped to 18% (normal sea-level air is 21% oxygen). We find that whenever the ODS shuts our heater off, our stove and oven continue to run without a hitch. So, in reality, the stove and oven are actually more dangerous, as they do not have built-in ODS units to shut them off when the oxygen in the room gets too low. about how vent-free heaters function at high altitudes. We use our heater all summer long as we travel through the western mountain states. 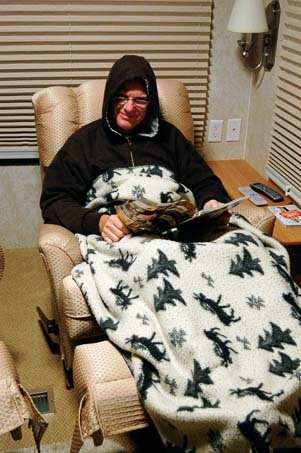 We find that it works very well at 6,000 to 9,000 feet, taking the chill off cold mornings and raising the temperature inside the RV from a brisk low to mid-40’s to 75 degrees within an hour. We have spent months at these altitudes. On occasion, if we have been running the stove and oven as well as the heater, the heater will unceremoniously turn itself off. This is no problem. We simply open the RV door to let some oxygen-rich air into the rig. 1. Run the RV furnace all night long to keep the rig at 50 degrees overnight, and then use the RV furnace to raise the temp to about 60 in the morning. We found that this method used gobs of electricity and propane and didn’t make us very warm. What’s worse, when we tried to use the vent-free blue flame heater after running the furnace, the furnace would not have sufficiently replaced the interior air with exterior oxygenated air, so the vent-free heater could not run very long before it shut off due to having insufficient oxygen around it. So, in essence, using the RV furnace meant we couldn’t use the vent-free heater. We found we could run the RV furnace all day long but the temps in the rig would never exceed 61-62 degrees (the high temps outside were in the 40’s, lows in the mid-20’s). 2. Leave the furnace off overnight and run the ventless propane heater in the morning to warm up the rig. The temps inside our bedroom typically stay about 10 degrees above the outside temps if we don’t heat the RV overnight, so we woke up on some mornings to interior temps in the high 30’s. (We close our bedroom door at night to help keep the bedroom warm). The vent-free heater miraculously heated our indoor RV temps to 70 degrees within an hour of turning it on. At this point, around 70+ degrees, the heater would shut off. We could coax it to run a little more by opening the RV door and fanning the outside air into the rig, but it would shut off again after another 10 minutes or so. So then we would turn on the RV furnace. Any sensible person would have gone and gotten electric hookups at a campground and run an electric ceramic heater, but we aren’t always very sensible. Camping at 10,000 feet in snowy weather is rather extreme. Most of the boondocking spots we stay at in the summer months are down around 6,000 to 9,000 feet, as I mentioned above, and the heater works beautiful at those altitudes. During the winter months we are typically at elevations of under 1,500 feet and the heater works like a champ without missing a beat. WHERE CAN YOU BUY A VENT-FREE PROPANE HEATER? We had the worst time trying to find places to look at these heaters and find people knowledgeable about installing and using them in RVs. In some states it is illegal to sell these kinds of heaters (here’s a link to the state-by-state regulations for vent-free gas heaters from ventfree.org), and in mountain towns they are scarce because of their issues with operating at high altitudes. In four months of summer travel when we were looking to buy, we found just two propane gas companies selling vent-free heaters, one in Jackson, MS and one in Kanab, UT. 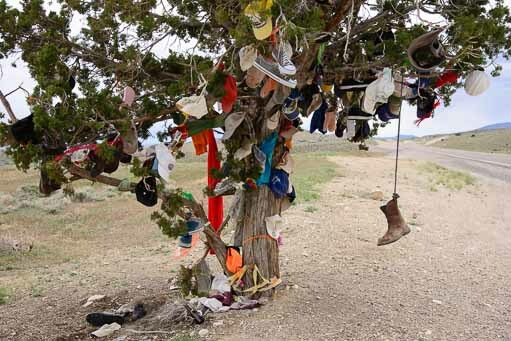 We ended up learning the most from fellow desert boondockers in Arizona, Nevada and California during the winter months and from salespeople in mom-and-pop hardware and RV parts stores in Yuma and Quartzsite, Arizona. If you know what you want, you can get a much better deal buying online, and Amazon sells all the major brands and accessories. We paid $290 plus $25 tax for our heater, a Vanguard 20,000 BTU blue flame with a thermostat and no blower (it came with feet). After buying, we found the same unit online with free shipping and no sales tax for $175 (Vanguard heaters are no longer made). 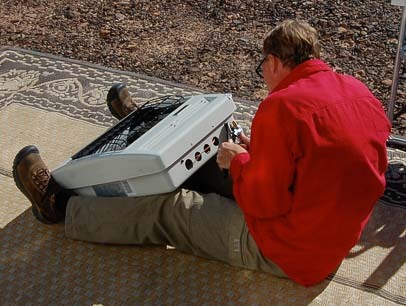 Ace Hardware told us they could order a similar unit for us, shipped to their store in a week, for $215. So we paid a premium for our unit, but we did talk to a lot of sales people in the process and we saw a lot of the units (and warmed our hands over them), and knew exactly what we were buying. Our entire project cost $385. The heater was $315 (including tax), and parts totaled $70. We were able to borrow the tools, but found they cost only about $15 to buy. We were quoted between $60 and $100 for the labor for the installation. As stated above, we also could have saved about $140 on the heater if we had purchased it online. 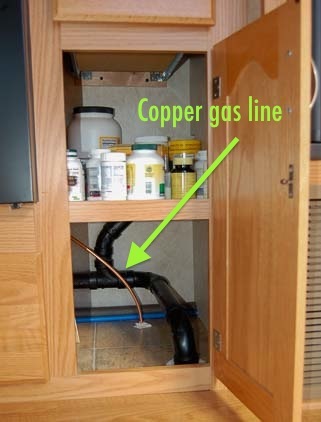 Following is a pictorial step-by-step guide showing how we installed our vent-free propane heater in our RV. 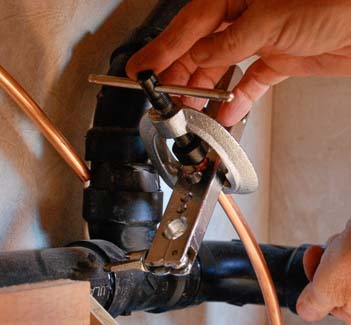 …however, the bulk of the installation involves tapping into an existing copper gas line to connect a new flexible gas line that goes to the heater. 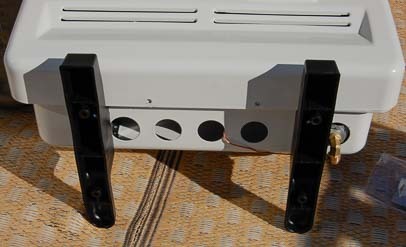 Attach the plastic feet so the unit can be freestanding and be moved around the trailer easily. 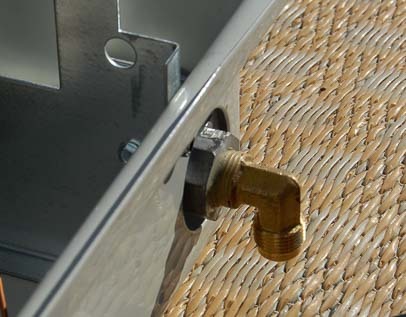 Attach a brass elbow fitting at the base of the heater. A flexible gas hose will eventually connect to this elbow. Attach a thermistor (an electrical resistor type of thermometer) for the internal thermostat. This went on the lower back corner of the heater. Our heater came with feet so it could be freestanding, and it also came with a thermistor, or resistor based thermometer, for the thermostat. These were attached before beginning the actual installation of the new gas line in our trailer. The brass elbow did not come with our unit, but we found one with the right pitch, thread and diameter at the gas and electric supply store where we bought the other fittings for our project. 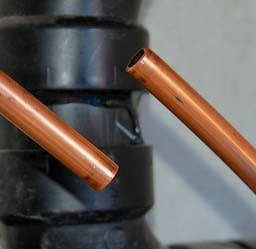 The new flexible gas line for the heater will connect into the existing copper line. We decided to tap into the copper gas pipe that runs between the refrigerator and the stove at the back of one of our lower kitchen cabinets. Mark measured the pipe and found it was 3/8″. The goal was to cut the existing pipe and insert a series of fittings that would allow us to attach a flexible gas hose at that point, effectively creating a new leg of flexible gas line. This hose would then run out through a hole drilled at the base of the cabinet and attach to the heater. All of this is low-pressure pipe and fixtures. 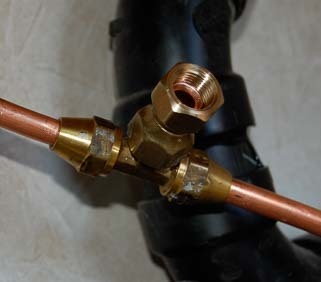 To create a new leg of flexible hose gas line requires a T-connector (to rejoin the severed pipe), F-F gender changer, On/Off valve and flexible gas hose with a stopper at the other end. At a gas and electric supply store we picked up a male-male T-connector that would be inserted into the cut copper pipe. 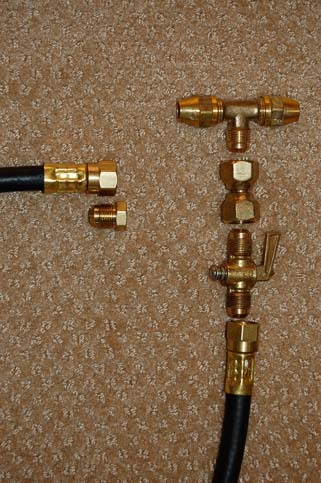 The base of the T would connect to a female-female gender changing connector, and then to an on-off valve (which has male fittings at either end), and finally to a female connector on the end of the flexible gas hose. Most of the year the heater would not be in use, so we bought a stopper for the end of the hose that goes to the heater. When the heater is disconnected, this stopper would be screwed into the end of the hose and the heater would be put in a closet. However, we later discovered we wanted easy access to our heater during all four seasons, so the stopper never gets used! The existing gas line is cut. A universal gas appliance hookup kit manufactured by Mr. Heater includes all these parts except the T-connector! 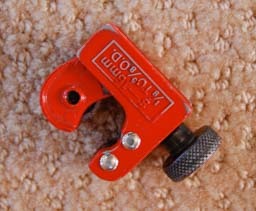 Specialty tool #2: Flaring Tool. The first step, after turning off the gas, was to cut the pipe. This requires a pipe-cutter, a small, inexpensive tool. 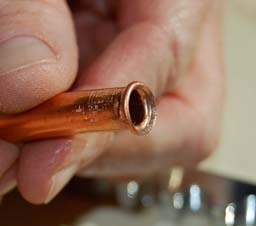 Once the pipe was cut, the next step was to connect the T-connector between the two severed ends of the copper pipe. This would be done by first sliding a female connector onto each of the two pipe ends and then flaring the ends of the pipe with a flaring tool so the connectors couldn’t slide back off again. The flare prevents the female connector from coming off the pipe. 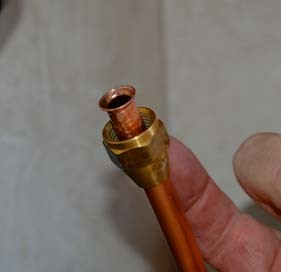 The male-male T-connector would be screwed into this (and its companion) female fitting on either end of the pipe, rejoining the pipe and making a new connection available for the gas hose to go out to the heater. Flaring tool with scrap practice pipe in it. Mark had never used a flaring tool to flare a pipe before, so he wanted to practice it first on a scrap piece of pipe. Flaring the real pipe inside the cabinet. He made the practice flare by inserting the scrap pipe into the appropriately sized hole in the tool and then screwing down both ends of the tool to snug the pipe into it — as if it were a bad guy in the old days having his head and hands put in the stocks in the town square! One flare done, now do the other. Then he inserted the pointed end of the flaring tool into the end of the pipe and twisted the crank, slowly flaring the end of the pipe as the point pressed further into it. He slid the female connector onto a short piece of pipe and felt a snug fit between the pipe and the connector. The flare was just right. 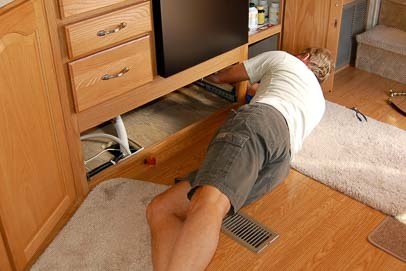 Now confident that he could flare a pipe properly, he contorted himself to get the flaring tool set up on the real copper pipe at the back of the cabinet. T-connector with F-F gender changer ready for the shut-off valve to be attached. He began by sliding a female connector onto one end of the severed pipe under the cabinet and flaring the pipe’s end. Then he did the same thing to the other piece of the severed pipe. 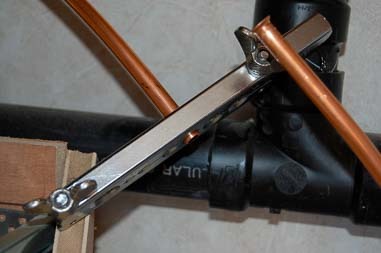 Then he screwed the male-male T-connector into the two female ends of the pipe to rejoin them, and he tightened the T-connector using two wrenches. He attached a female-female connector to the base of the T, making it possible to screw the male-male valve into place. This valve would allow the gas to the heater to be turned on and off. After the valve, he attached the female end of the gas hose. 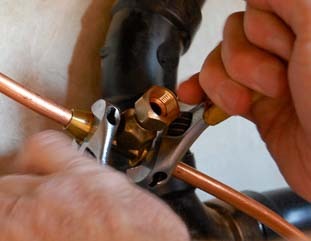 The new flexible gas line connects to the shut-off valve. 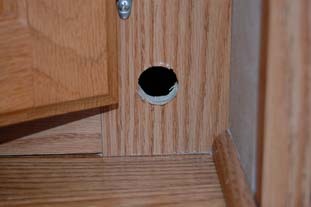 Finally, he drilled a hole in the front base of the kitchen cabinet and ran the gas hose through the hole. The other end of the gas hose was attached to the elbow connector he had placed on the bottom of the heater. Tightening all the connections with wrenches, and turning the gas to the trailer back on, the heater was now ready to be used. The new flexible gas line will come through this hole and connect to the heater. Mark checked for gas leaks using a tiny spritzer bottle filled with a few drops of Dawn dish soap and water. Spraying this mixture on each connection, he looked for bubbles to form which would indicate a gas leak. To give us flexibility in moving the heater around the rig, we originally used two lengths of gas hose: a 3′ length for under the cabinet and a second 12′ length that attached to it with an inline male-male connector. What a great little heater!! The idea was that the 12′ gas hose would give us lots of flexibility for moving the heater around the trailer. However, we found that it was too long and too bulky and the best position for the heater was close to the stove anyway. So we replaced the 12′ hose with a shorter 4′ one. After the installation was finished, it didn’t seem like such a big project after all, and what a thrill it was to toast ourselves in our warm buggy. Our timing was perfect: the next week brought a big cold front, multiple days of rain, lows in the 30’s and highs in the fifties. We were snug as bugs in a rug while the winds howled outside. There are tons of choices for installing a vent-free propane heater, but these four are among the most popular. If you buy a heater from Amazon, make sure it is PROPANE and not NATURAL GAS, as the pictures look the same. We receive a 4-6% commission for purchases made through any of our Amazon links (at no cost to you) which helps us maintain this site — thank you! Good luck with your project, and stay warm! Disclaimer: This blog post describes our vent-free propane heater installation. We are not responsible for any installation other than the one in our own rig. Crater Lake National Park in Oregon – Bluer than blue! May, 2014 – After recovering from our mad dash across northern Nevada and southern Oregon, our first priority was to visit Crater Lake National Park. We had heard about this beautiful park many times over the years, and now we were blessed with the most perfect weather to go see it on the Saturday of Memorial Day Weekend. 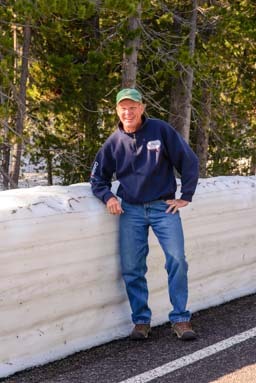 Wow – the snow is waist deep! As we approached the park, we suddenly found ourselves driving between banks of snow. May, 2014 – We were flying high as we left Ely, Nevada, where we had been thrilled by the Nevada Open Road Challenge car races. With car racing on our minds, the only direction we could head from there was north, up to the Bonneville Salt Flats just over the Nevada border in Utah. The Bonneville Salt Flats are a massive, natural expanse of crusty old table salt that is layered thickly on a valley floor and extends for miles west of Utah’s Great Salt Lake. They have long been used for attempting and setting land speed records. The road from Ely to the town of Wendover on the edge of the salt flats is a narrow ribbon that winds through vast empty valleys. It soon hypnotized me as we drove.